(Phys.org) —A Scottsdale, Arizona, company is making the news with its fold-able solar charging system of 18 panels that resemble a flower, and can sit atop a vehicle, which gives the device the appearance of a supersized canopy or floppy hat. At least that is the way in which the Lotus Mobile solar charger made its showcased appearance, perched on top of an orange Tesla car, no less, just in case all eyes were not totally riveted. 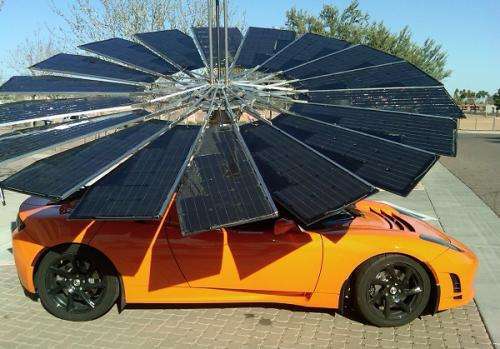 The Lotus Mobile solar power system is the brainchild of the orange car's owner, Joseph Hui, CEO of the Scottsdale, Arizona, company Monarch Power, and also a professor at Arizona State University. Hui, inventor and entrepreneur, took to his orange Tesla late last month in Phoenix to demonstrate the Lotus Mobile on top of the car, as a mobile solar power system light enough to transport by means of a small vehicle. Hui said he chose the lotus flower design because it inspired him to transform solar energy from heavy, strapped down panels to become light, personal and portable. The Lotus Mobile is designed for any disaster that takes down power sources or for any power-less global village in need of power. The solar charger could also be used for camping. This device can fold and unfold like a flower. Hui wanted to achieve a solar array specially built for portability as well as energy capture. The circular array design succeeds in capturing sunlight to recharge an EV, fridge, or other appliances. Hui wanted to make the point that this was a lightweight solar power solution that can go where it is needed Hui has stated that he has three end uses in mind for the Lotus Mobile—for appliance and auto charging; for emergency response, and to provide power for those underserved areas around the globe. This is a photovoltaic (PV) solar array, according to SolarServer. Hui kept the weight down, according to CleanTechnica, by using both plastic and aluminum. Monarch's web site offered this comment: "Lotus Mobile follows the sun on two axes, giving 30 percent more power than rooftop solar panels. It's also less expensive because of significantly less structural support, since 70 percent of the traditional panel system cost is related to architectural placement." Park that in Watts or South Central. For the last couple years I've been making a joke here and elsewhere that the new ObamaCars will have optional solar paint and personal rooftop windmills. Life imitates humor. Shootist is right. American society is too greedy, ape like, and uncivilized to use modern technology. The principle joke here is the numerical and scientific illiteracy of Conservative Americans who post here. The panels have an approximate effective surface area of around 6 square meters. They therefore produce less than 3kw of power, so charge times would be on the order of 2 or more days of direct uninterrupted sunlight. Probably closer to a week. So leftists promote a device for a car that will let you drive it once a week but conservatives are scientifically and numerically illiterate? Wow, great windmill! For what it's worth, at least it's an idea, whether or not it makes a popular floppy hat for my vehicle. For a compact add-on, to a number of machines and situations (with a little more work) it looks sorta fascinating. It sparks the imagination. I think the idea they are trying to get across is that it is possible to make solar collectors that are pleasing to look at. Why go to all the effort to make this, when they should be trying to make the skin of the vehicle out of photoelectric materials... However I can envisage this being incredibly fragile. This is also good as a shade for a parked car under the hot sun. I can see this as a great concept. Looks good, but is pretty useless for charging a car (unless you use your car only once a month or so). The power delivered tothe area just isn't enough. Somehow I can't believe that this thing fits inside the trunk of an Elise. Its trunk is tiny.